Staff work within a 1:4 ratio up to the ages of three and a 1:6 ratio once children have reached 3 years old. There will be a different craft activity from day to day, children have the opportunity for adult led activities where knowledge and understanding of the world comes into play and also child led activities where they can take the learning objective and interpret it in their own way. 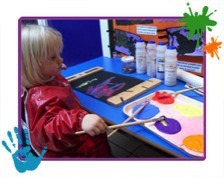 The graphics table is always available encouraging children to mark make in all areas of their play. Children have the freedom and opportunity to experiment and explore with paint, glue, crayons, pens, pastels, chalks, sand, water, rice, flour, play dough, corn flour, cooking, and the list continues!